The shooting of this retrofit process was made using a photographic technique known as time-lapse, consisting in capturing still photos at defined time intervals and then subsequently combining these in a post-production process at a specific speed. Using this technique, and for the duration of the milling machine retrofit process, NC Service installed a camera at its facilities, to take a photo every minute at the place where the CORREA FP30/40 was being retrofitted. This resulted in hundreds of thousands of photos, reflecting how this milling machine changed as the retrofit work progressed. These photos were subsequently edited and assembled, providing the accelerated movement of the photos selected through continuous reproduction at a given rate, and finally achieving a video which, in less than 2 minutes shows the progress of all the stages in the milling machine retrofit process performed by the NC Service technicians at the company´s facilities in Burgos. The milling machine selected for the filming of the retrofit process, was a CORREA FP30/40 gantry milling machine owned by an English manufacturer from the foundry sector. As a result of this customer´s increasingly demanding production requirements, there was a need to retrofit the machines in its production line in order to re-establish their original performance and accuracy. 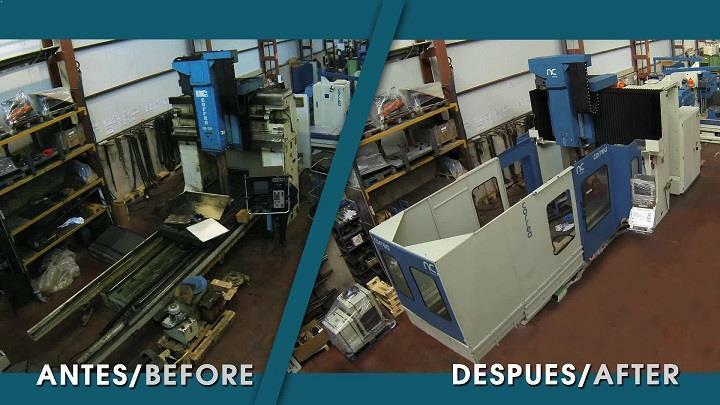 NC Service therefore carried out the retrofit and technological upgrade of the CORREA milling machines owned by this English company, considerably improving the quality of production and also customer satisfaction.